Stem cell therapy can regenerate heart muscle in primates, according to a new study by researchers at the University of Washington. The researchers used heart cells created from human embryonic stem cells to successfully restore damaged heart muscle in monkeys. The results of the experiment suggest that the approach should be feasible in humans, the researchers said. "Before this study, it was not known if it is possible to produce sufficient numbers of these cells and successfully use them to remuscularize damaged hearts in a large animal whose heart size and physiology is similar to that of the human heart." said Dr. Charles Murry, UW professor of pathology and bioengineering, who led the research team that conducted the experiment. A physician/scientist, Murry directs the UW Center for Cardiovascular Biology and is a UW Medicine pathologist. Murry said he expected the approach could be ready for clinical trials in humans within four years. On average the transplanted stem cells regenerated 40 percent of the damaged heart tissue, said Dr. Michael Laflamme, UW assistant professor of pathology, whose team was principally responsible for generating the replacement heart muscle cells. "The results show we can now produce the number of cells needed for human therapy and get formation of new heart muscle on a scale that is relevant to improving the function of the human heart." Laflamme said. Ultrasound studies of the macaques' hearts showed that the ejection fraction, an indication of the hearts ability to pump blood, improved in some of the treated animals but not all. 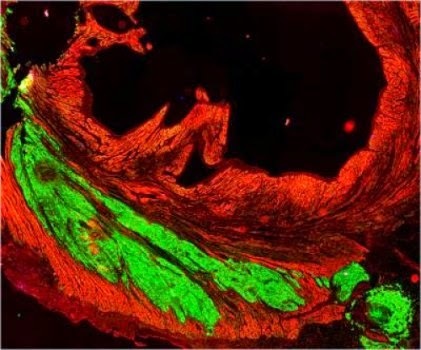 The researchers also found that arteries and veins from the macaques' hearts grew into the new heart tissue, the first time it has been shown that blood vessels from a host animal will grow into and nurture a large stem-cell derived graft of this type. Going forward the UW researchers will work to reduce the risk of arrhythmias, perhaps by using more electrically mature stem cells. They also will try to demonstrate definitively that the stem cells are actually strengthening the heart's pumping power. "These cells have improved the mechanical function in every other species in which they have been tested, so we are optimistic they will do so in this model as well." Murry said.